Where Do The 2016 Presidential Candidates Stand on Animal Rights & Welfare? Election season is well underway, and with several debates behind us, candidates interviewed, and issues (sometimes) discussed, one issue (very near and dear to our hearts) that’s too often overlooked and undervalued are the candidate’s positions on animal rights and welfare. How have our presidential hopefuls historically voted on legislation that supports the welfare of animals? Which ones will make animal rights a priority? Have any voted against policies that would protect animals? During her eight years in the U.S. Senate, Hillary Clinton was a strong supporter of animal protection policies, earning a 100% score on the The Humane Society Legislative Fund‘s Humane Scorecard (an annually published “snapshot” of every federal legislator’s record on animal protection issues), in the 108th Congress, a perfect 100+ score in the 109th, and an 83 in the 110th. She cosponsored legislation dealing with horse slaughter and animal fighting, as well as bills to stop the processing of “downer” livestock and to crack down on puppy mills where dogs are routinely mistreated and used as breeding machines. She co-sponsored Senate Bill 261 which established felony-level penalties for violations of the federal law on dog fighting, cockfighting, and other animal fighting. As a Senator, Clinton also signed letters requesting more funds for the U.S. Department of Agriculture to step up enforcement of the Animal Welfare Act, the Humane Methods of Slaughter Act, and the federal animal fighting law. But, for some reason, Clinton chose not to vote on Senate Bill 714 which, had it passed, would have prohibited the use in research of dogs and cats obtained through random sources, which can include theft of family pets and fraudulent response to “free to good home” ads. As for whether Hillary would be bringing any four-legged family to the White House, she currently shares her home with a chocolate Lab named Seamus, a Toy Poodle named Tally (who’s pictured below) and another small dog named Maisie. Though far less frequently talked about than the other two candidates, Libertarian presidential candidate, Gary Johnson, will be on the ballot in all 50 states this November. Still, very little is known about his own position on animal rights and welfare. While Governor of New Mexico, Libertarian candidate Johnson vetoed a bill that its writers hoped would stop animal hoarding by limiting the number of animals a person could legally own. He vetoed the bill with the belief that people should be able to have as many pets as they can care for. If the pets are not cared for, animal welfare should address that. He believes that animal hoarding is a mental illness, that no bill can cure someone of mental illness and this bill would have made that illness a crime. The Libertarian position is generally for the federal government to take a step back and, instead, for organizations like the Humane Society, the Audubon Society, Nature Conservancy and other naturalist organizations to manage animal conservation and welfare. As for any pets who might join Johnson in the White House, it will remain to be seen. Trump frequently poses with the Westminster Kennel Club Best in Show winners each year. Here he is with Miss P, the 2015 winner. Because Donald Trump never held public office before his candidacy for president, it is difficult to track an official position on animal welfare policies and past animal rights issues. However, during his run for office he has publicly opposed policies that negatively impact the environment and animals. Though very little is known about Trump’s position on animal welfare issues, when he owned the Steel Pier in Atlantic City, he was involved in canceling an inhumane horse-diving act. And, while Trump’s sons are trophy hunters, the candidate has both defended their right to participate in the sport, but has explained that he doesn’t understand why they would want to do it. 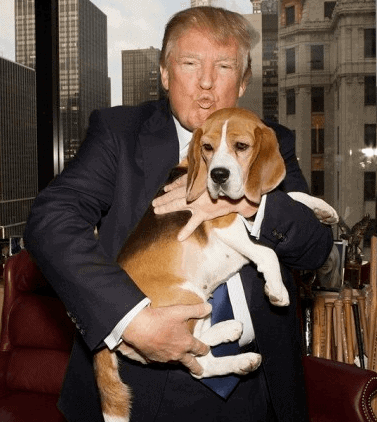 Trump has, for many years, been a big supporter of the Westminster Kennel Club dog shows, posing annually with the Best in Show winner. On the downside, Trump recently said he would no longer attend another Ringling Brothers circus after the company discontinued the use of elephants in their performances. As for any pets who might join Trump in the White House, it will remain to be seen. While it remains to be seen which of the candidates will enter the White House and how their positions and policies will affect our nation’s animals, that lucky leader won’t be the first to think of animals while in office! 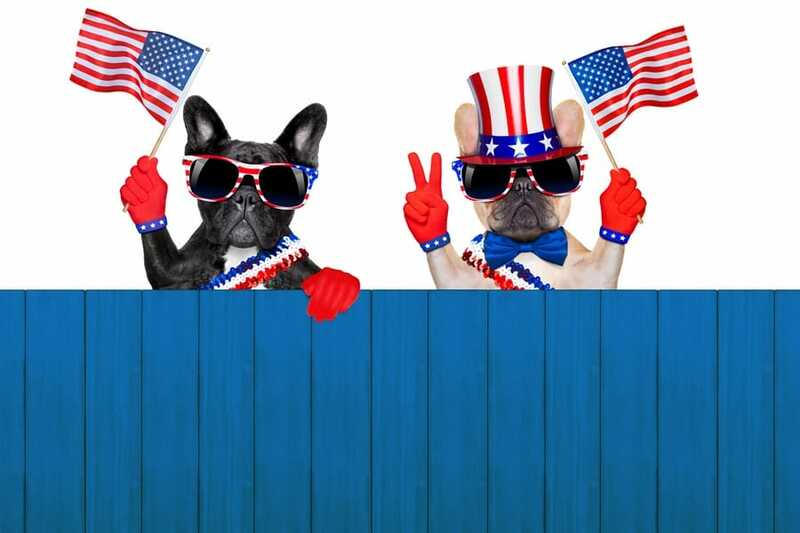 Check out this look back at presidential pets throughout history! It’s everything you ever wanted to know about every dog that has ever lived in the White House! Click here. Yay Bernie!! Vote Bernie Sanders!! Bonny: you are confusing PETA for the Humane Society. It is PETA that is apposed to eating meat and puts many restrictions on owning pets. Also PETA does not run shelters they Are about expanding rights for animals. The Humane Society runs shelters across the US. Operates low cost spay and neuter clinics and educates people about animal care and welfare. Bernie and Hillary both scored 100% Republicans seldom show concern for animals but I don’t think anyone is surprised by that. The lower the rating that the Humane Society gives on the self-proclaimed “scorecard”, the better I like the candidate! The Humane Society is not an organization that protects animals, they are a money making activists. The money you give them does not help animals/shelters, it goes into campaigns and lobbyists. Please, everyone read and understand their motivation and ultimate goals… no pet ownership of any kind! For those of you who eat meat, their against that too! Do not vote for candidates that support this radical organization. I don’t think the candidates have mentioned anything on animal rights. Their too busy fighting with each other. We due need more animal right for those poor animals who have nobody but the people who stand up for them. Come on people, e-mail the candidates and ask them about it.